Toothed Circle, egg tempera on calfskin parchment, 4 3/4 x 7 inches. 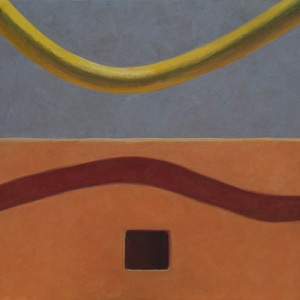 A circle and a rectangle are the main players in this painting's drama: a circle catching light alongside a deeply shadowed space. 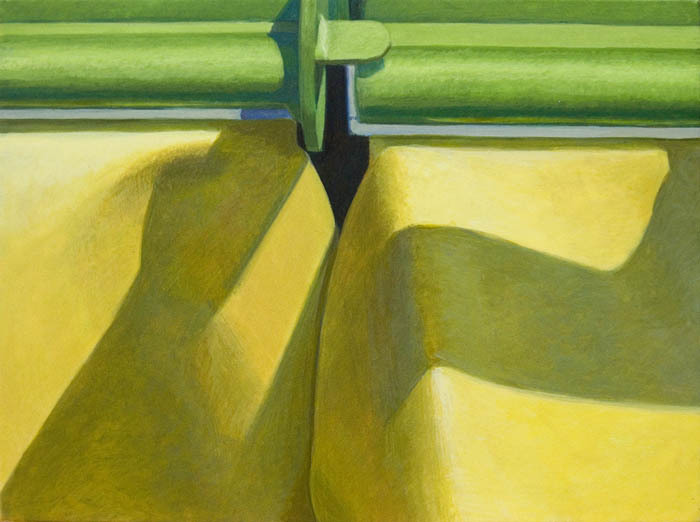 I used the insight on mixing color gained from my last painting Yellow Folds to layer colors until I had an illusion of a space receding into fathomless dark. 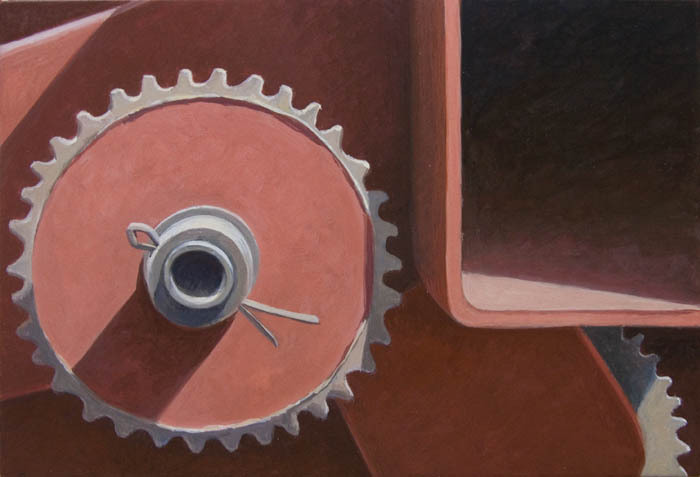 One big question for myself as I worked on the painting was about the cotter pin at the center of the circle. I put it in, then painted it out, then brought it back as I decided that I liked the little dance it performed, making the image less solemn. Let me know what you think; I can always take it out again. The ordinary, lowly potato may be my favorite vegetable; it is delicious prepared in so many different ways and is always good for a last minute meal. And paired with onions they are heavenly. Of course I grow my own potatoes, and hard as it is to believe, the flavor of home grown is far superior to that of conventionally grown spuds. The variety you see above are my favorite, Carola, a yellow fleshed potato, good cooked in so many different ways. My favorite boiled potato is French Fingerling, and early potato Red Norland. 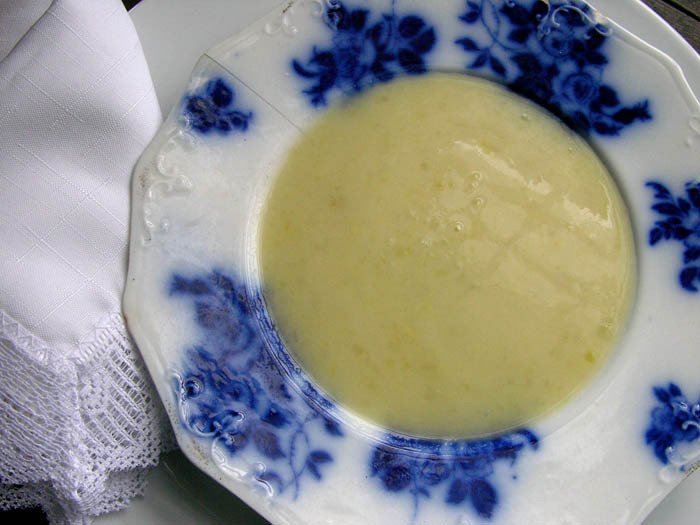 I used Carolas for the two recipes that follow, though you can use any good potatoes for soup and a roasting potato for that recipe. They are both simple and easy to prepare, because those are the only recipes I tend to use. The previous potato recipes I've posted are Potato-Sorrel Soup, Kale and Potato Soup, and Potatoes and Arugula Soup; you can see I love soups. This recipe comes from Julia Child's French Chef Cookbook and is quick, easy, delicious and comforting. Simmer the vegetables, water and salt together, partially covered for 40-50 minutes until vegetables are tender. Mash the vegetables in the soup pot or put through a food mill. I simply use a potato masher. Taste for seasoning. Remove from heat and add the cream or butter. I much prefer using cream. 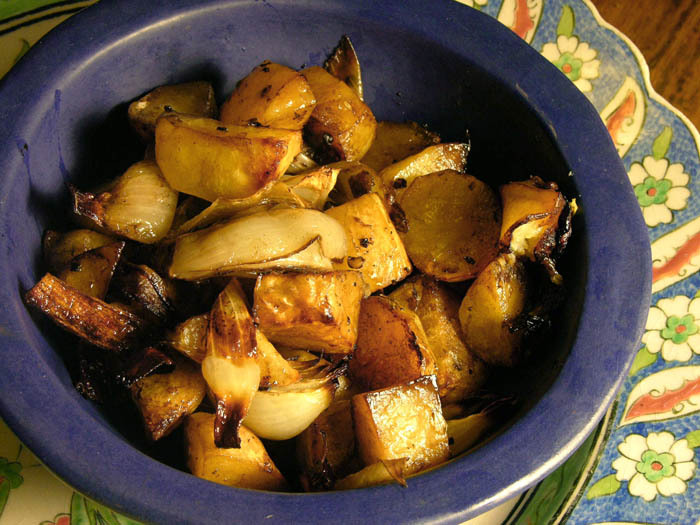 This wonderful roast potato recipe comes from Potatoes: A Country Garden Cookbook. I love the flavor that the balsamic vinegar gives the vegetables, and they come out of the oven looking so richly colored. Put potatoes and onions in a large pan, pour oil on them and toss to cover well. Raise heat to 450º, add remaining ingredients and toss thoroughly. Continue to roast for an additional 30-40 minutes until vegetables are browned and potatoes crisp on the edges. 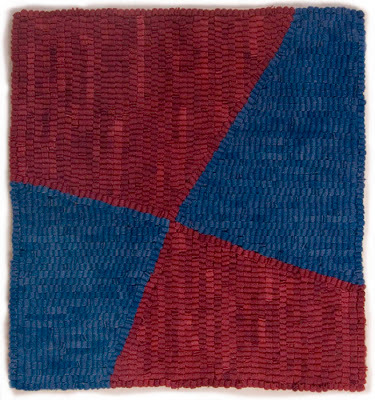 Red/Blue Ground, hand dyed wool on linen, 11 x 10 inches. 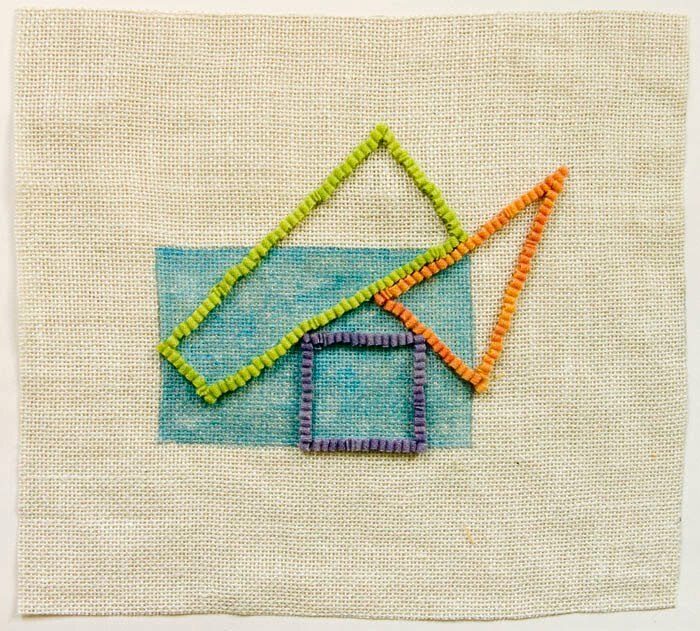 This piece, of triangles coming to an off-centered point, is the third in my series of figure/ground images, after Purple/Green Ground and Pink/Yellow Ground. My goal is to have the color-shapes have equal weight so that none take priority as positive or recede as negative space. 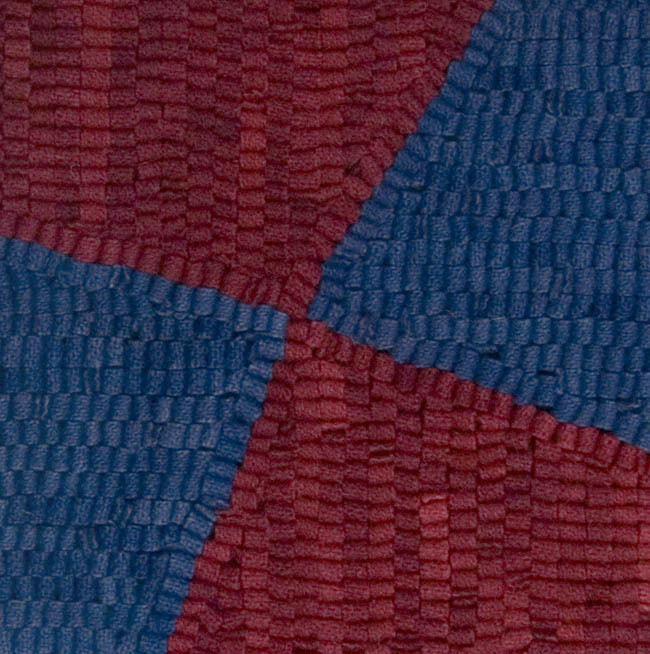 I feel very happy about Red/Blue because when I look at it, the triangles push forward and back, first the blue taking precedence, then the red, in an active visual dance. I had a bit of trouble balancing the color because at first the top red shape was too cool in color and the intense blue took over. I pulled out some of the strips of red wool and replaced them with strips of a lighter and warmer red from the end of the piece of dyed wool. 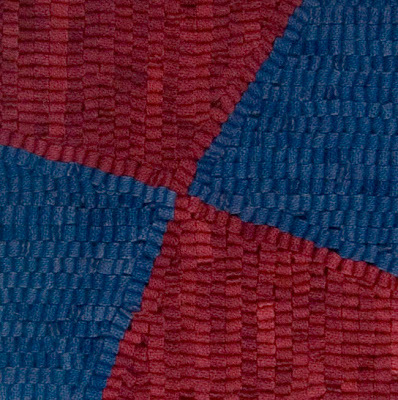 You can see how they add some life to the red, which helps it counteract the intensity of the blue. I also like the way the two red points meet, and the blue almost, but not quite. It creates an interesting tension that almost flips into narrative. To be rapt with satisfied attention, like Whitman, to the spectacle of the world's presence, is one way, and the most fundamental way, of confessing one's sense of its unfathomable significance and importance. The light that flowed one morning across the items ranged on the shelves of the hutch illuminated only partially, the rest of the form sank back into shadows. The effect was like 17th century Dutch or Spanish still life. 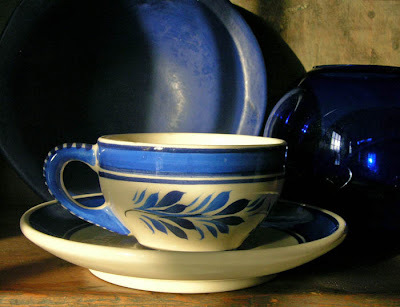 So I decided to photograph some of my collection of teacups, gathered over the years because of their charm and for use in still life photography. 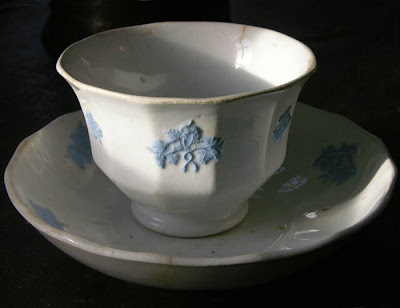 What is it about a teacup that is so evocative? 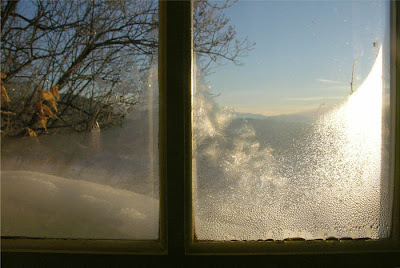 is it their fragility, their reminder of comfort? 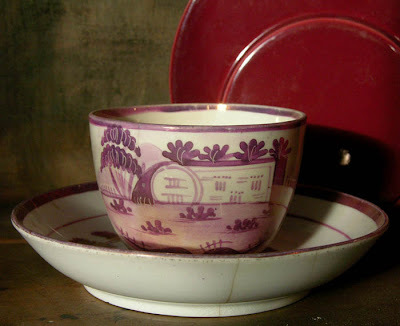 This cup was a gift from a friend, an old lusterware cup and saucer with marvelously inventive houses like nothing seen in the real world. The two cups above, along with the lusterware teacup, do not have handles. 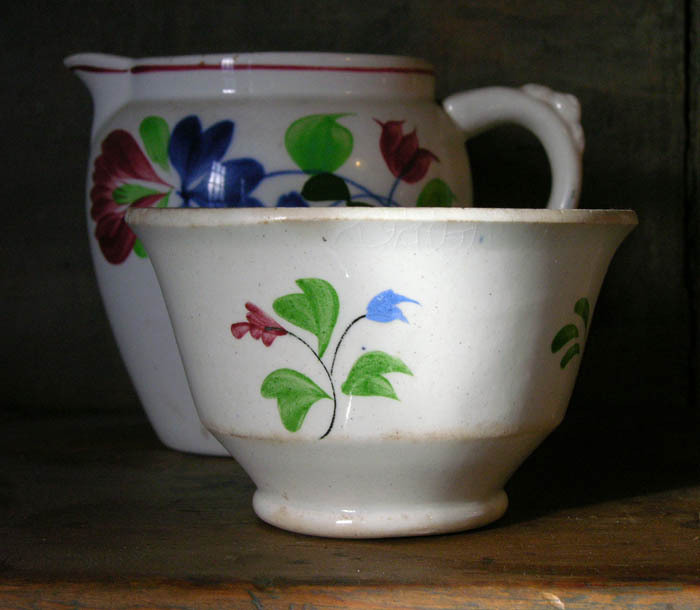 I was told by an antiques dealer that it meant they had some age, as handles were a later introduction. 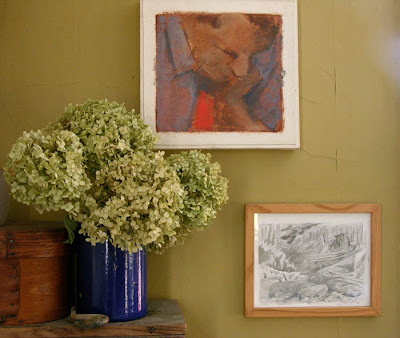 I'm particularly fond of the delicate painting of leaf and flower. And to end, two modern cups, mass produced, likely for the restaurant industry, and maybe not even teacups. 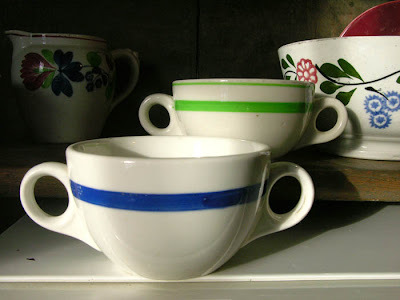 But I love their rounded handles like little ears sticking out from their sides, inviting hands, fingers, to lift the cup, and lips to taste. 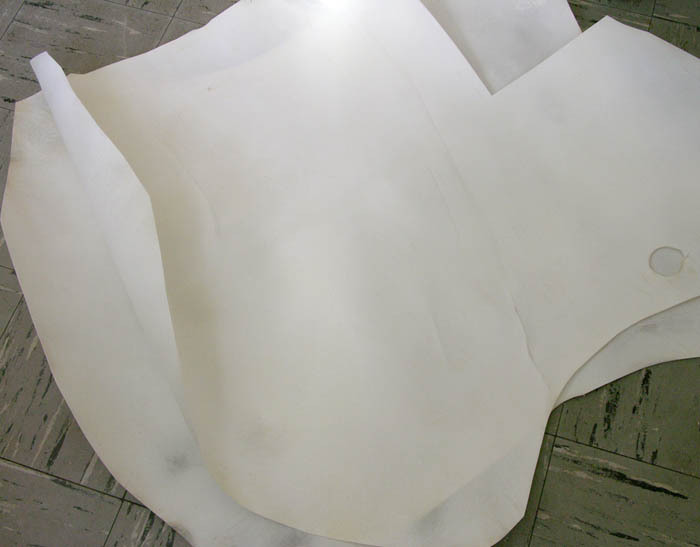 Yellow Folds, egg tempera on calfskin parchment, 4 7/8 x 6 1/2 inches. While working on this painting I learned something new, which is quite a pleasure after painting with egg tempera for over 16 years. There are always bits of new knowledge acquired with each work, but here I felt I got something that will help a lot in future, and it was in that tiny bit of empty blackness at the center of the painting. I had laid out in my palette these colors: titanium white, cadmium yellow medium and light, cadmium red medium, ultramarine blue, and chrome oxide green. When it came to painting that dark space, I began glazing a mixture of cadmium red and chrome oxide green, which was quite dark, with layers of ultramarine blue. I also mixed blue and red and glazed that. 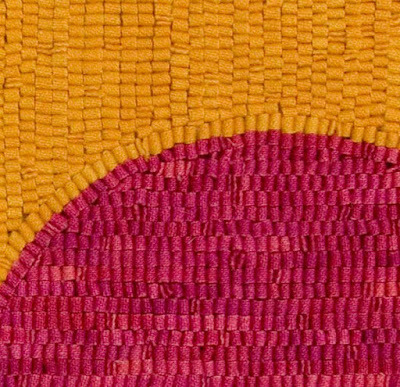 Thin layers of these colors, laid down one on top of another, eventually yielded a deep rich dark without a touch of black. It seems to me that the color is more interesting than a simple layering of black. 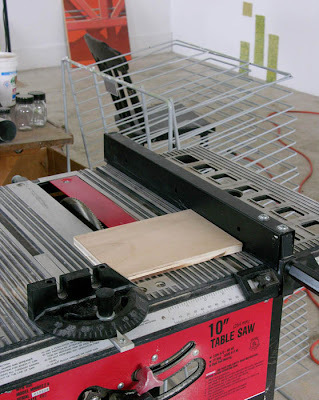 And this is something I haven't done before! 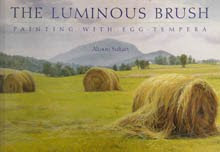 One wonderful quality of egg tempera is its translucence, which allows for colors in lower layers to affect ones in upper layers, yielding remarkably vibrant color with a sense of depth. You can see something of this in the detail above, in the shadowed areas. I kept adding more color, lighter and darker, warmer and cooler, until I was satisfied. 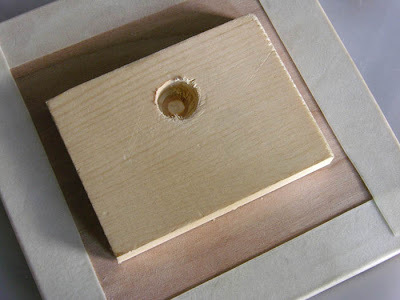 As I work, I feel the painting get more solid under my brush, as though I was making a relief sculpture. My regret with this painting is that I didn't make it a little bigger, so the form would be more dramatic. 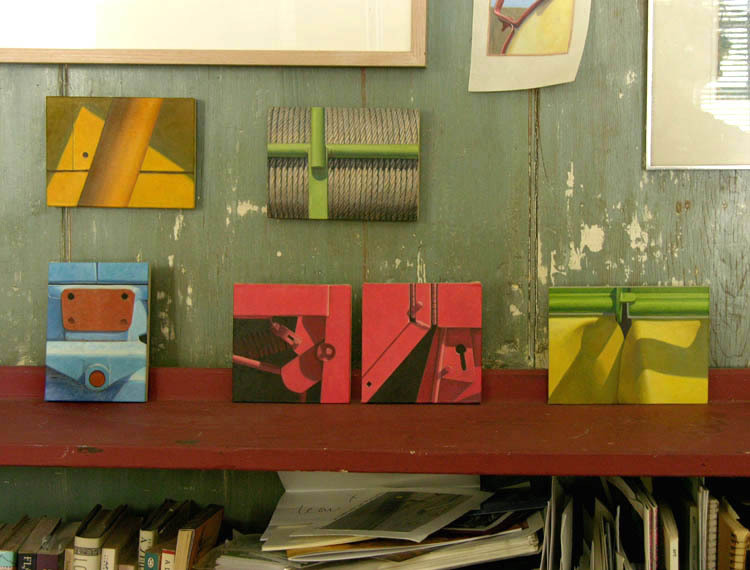 Below you can see it with other recent paintings. I think it looks good next to the red diptych, but the scale seems a little small in relation to the others. This is the view into the living room from the doorway of the back room/office. The room faces south, so on a sunny winter's day, the light pours into the room. 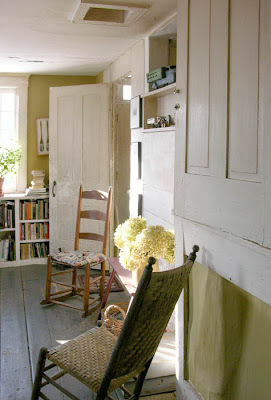 On the right is another built-in cupboard, this one very shallow so perfect for storing odds and ends. The rocker you see in the foreground is a porch rocker that I bring indoors during the winter months. On the floor are a large old braided wool rug, and glimpsed under the chair, one of the first hooked rugs that I made, using a kit. 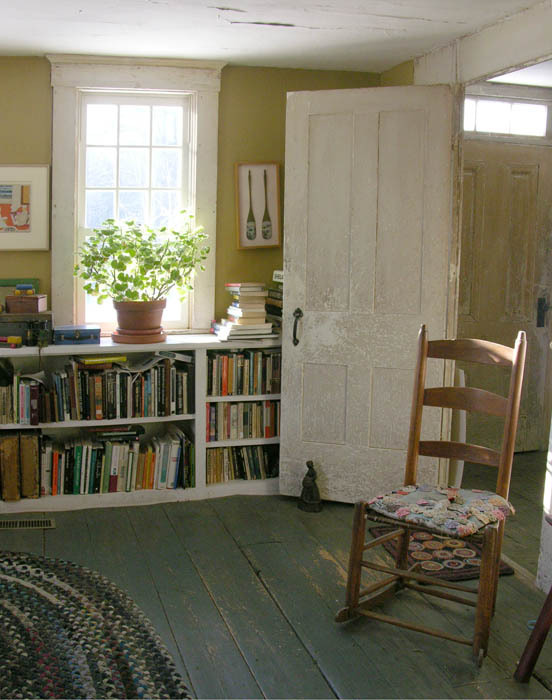 Each summer I keep two plants on my little porch, a geranium and a rosemary, and during the cold months they sit on the living room bookshelf in front of the two south facing windows. 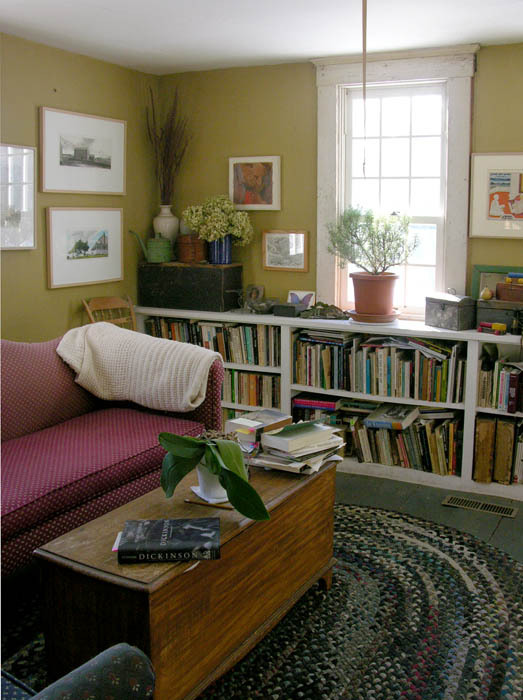 The low bookshelves, along with the one in the office, are overflowing, with books piled behind the door and on the blanket chest serving as a table. An orchid also sits on the table; I keep hoping it will bloom again, but I don't seem to have the knack. My mother made the cozy afghan draped over the couch. And the final view, of the back wall of the room. 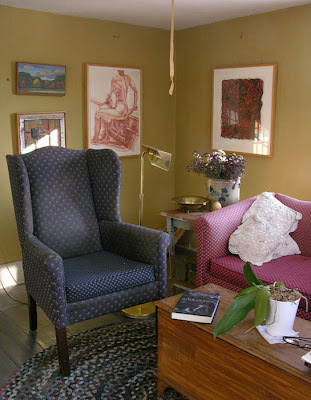 I should mention that the chair and sofa are antique reproductions, which I felt would maintain the character of the house. 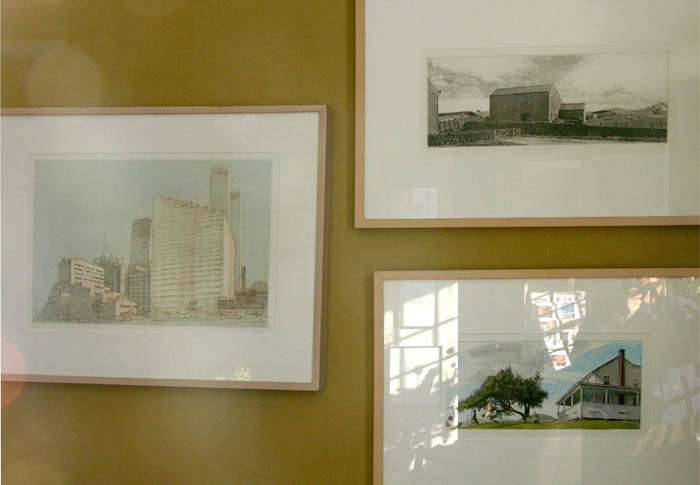 I have a lot of art in this room, mostly that of friends. The oil painting above is by Susan G. Scott, the drawing by Sam Thurston. On the right are two drypoints of mine from the mid 80s, the lower one with watercolor. (sorry for all the reflections.) On the left, a print by Rackstraw Downes; I believe it's a soft ground etching. 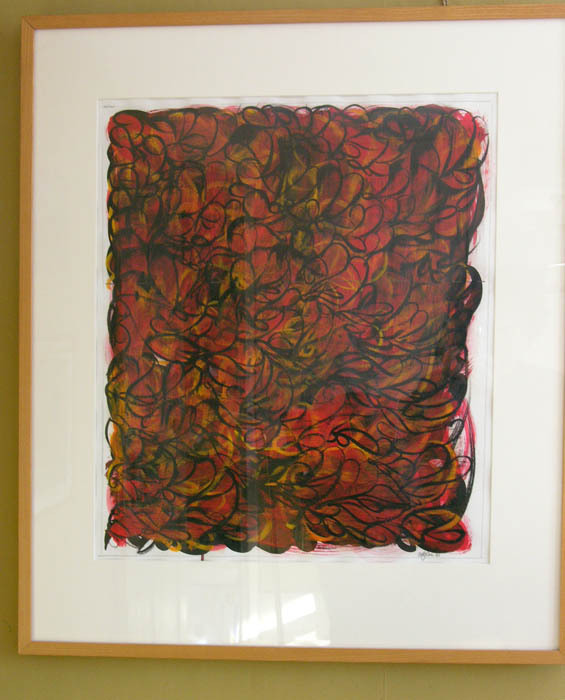 A work on paper by Cathy Clair Cone. 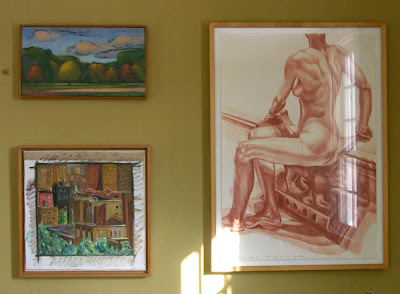 A landscape by Jean Silverberg, cityscape (a view from the my former loft building) by Lynn Rosenfeld, and a lithograph by Philip Pearlstein. On the wall adjoining what used to be a mantle over a now defunct fireplace, a small lithographic engraving by a Scandinavian artist whose name I didn't record. 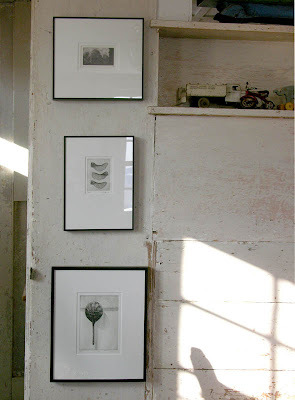 Below that, two copper engraving by Joe Sultan. 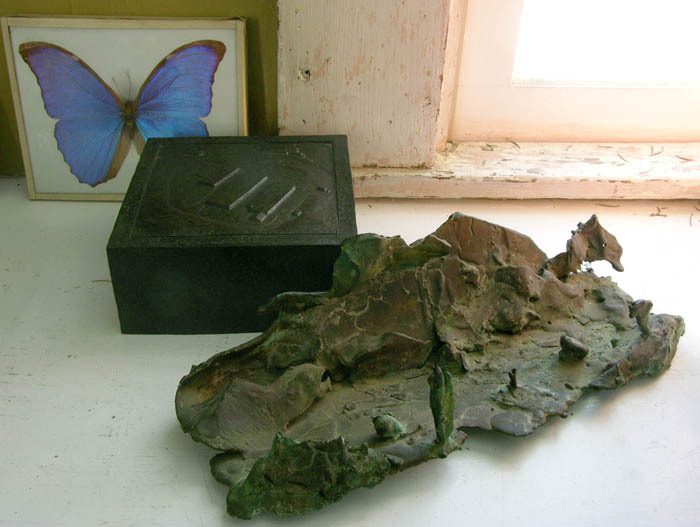 And finally, two small pieces of sculpture, both landscapes but of very different character. In the foreground Lynn Rosenfeld, behind that a low relief by Harry Roseman. 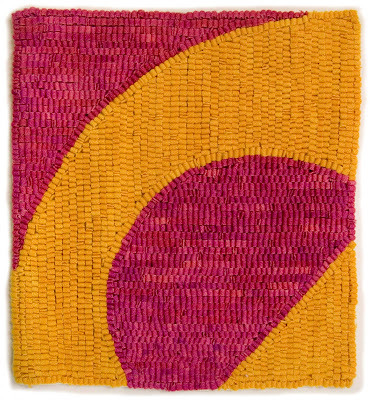 Pink/Yellow Ground, hand dyed wool on linen, 11 x 10 inches. 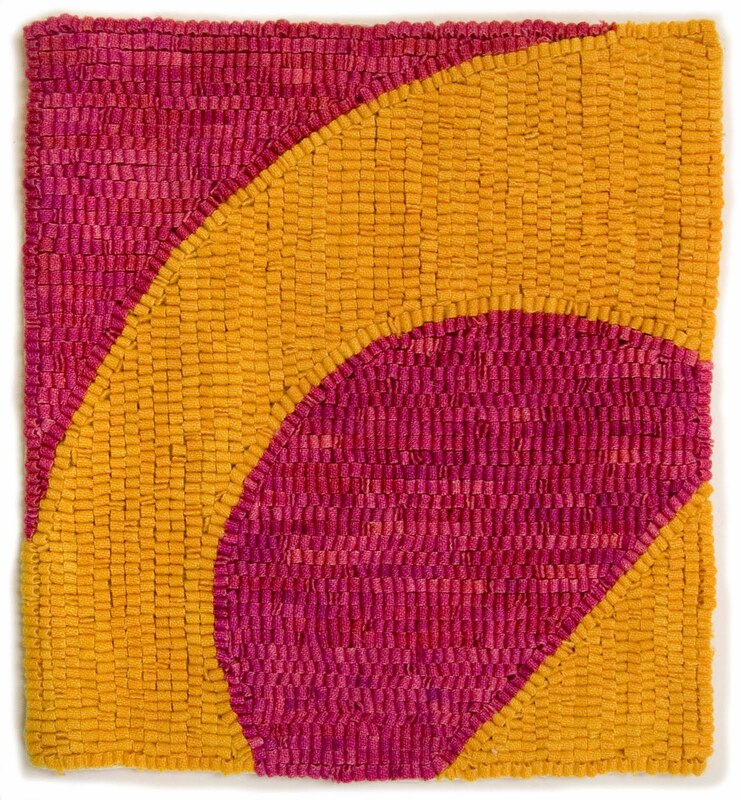 I do like the combination of a warm yellow, tending toward orange, with the cool sharp dark pink. As I'm working with the dye pots, I keep carrying them over to the window to see the color in natural light, lifting the wool to see one color next to the other in order to get a good balance, but it's not until the wool is dry that I can see the final colors. 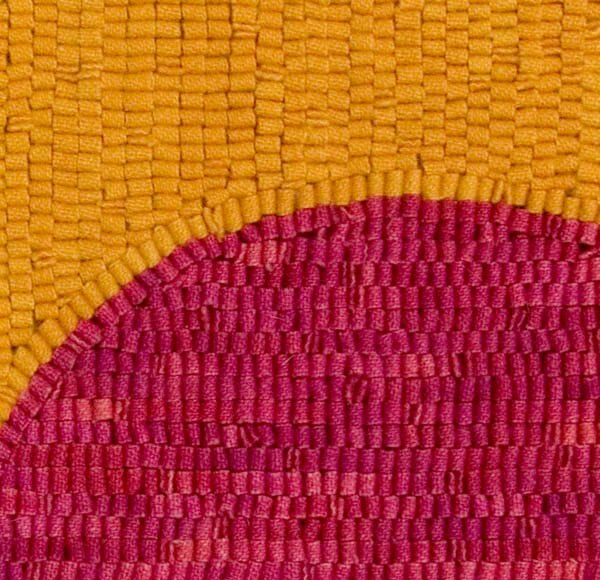 Often there are surprises, most that I enjoy living with, while there are times I have to put the wool back in the pot and re-dye it. I like the uncertainties and challenges, very different from those of my paintings. A Harbinger of Spring: The Seed Order has Arrived! 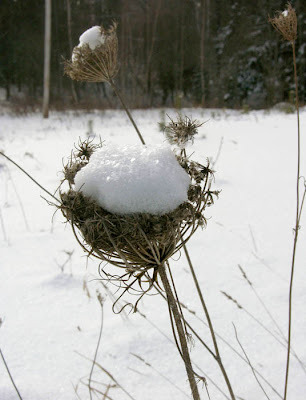 Winter will not last forever, the snow will recede, the soil will warm and ready itself to accept seeds. There's nothing in mid-winter so forward looking and cheering as walking into the post office and being handed the box containing seeds for the spring and summer garden. Even Blinky the cat was excited about it, as he jumped up to smell the packages when I spread them out to photograph them. I don't want to make any of you guilty who haven't yet sent in their order; I always work on mine during Christmas week, a festive thing to do then. 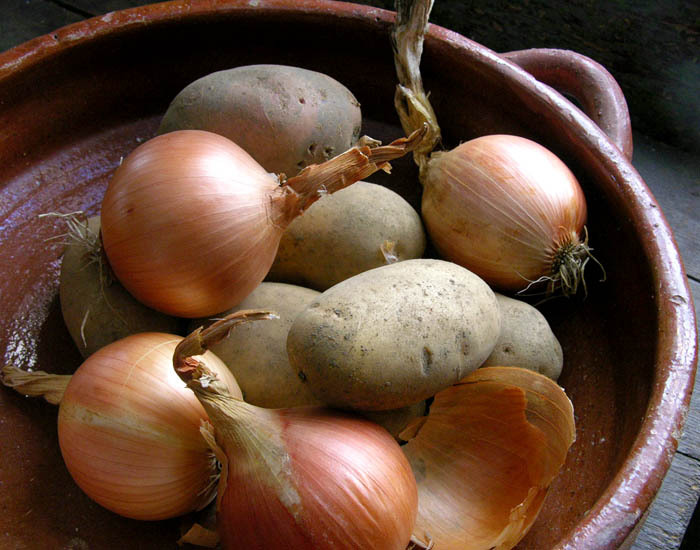 I like to start my onion and leek seeds very early, in late January to early February, so the seedlings are a good size when I put them in the garden in early May. 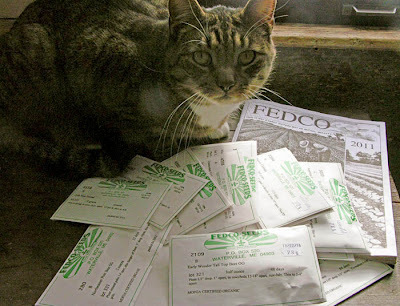 As you can see, I buy my seeds (sometimes I get a few from other companies also) from Fedco Seeds a cooperative company in Waterville, Maine. I highly recommend them: their prices are great, their plant descriptions accurate and very helpful, they specialize in varieties for northern gardens, and their customer service is wonderful. 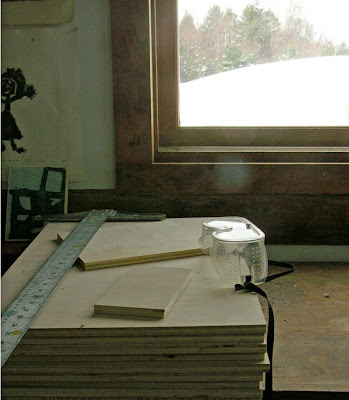 Rather than a big, glossy catalog, theirs is on newsprint and is full of antique illustrations. It makes me happy to buy from them. 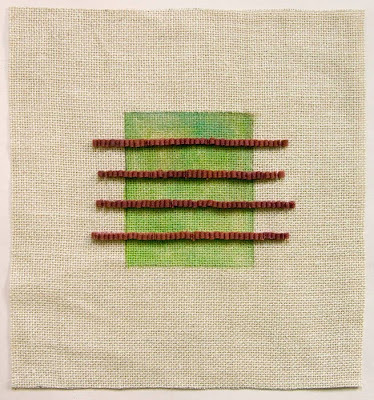 2011 #1, hand dyed wool and egg tempera on linen, 12 1/2 x 12 inches. 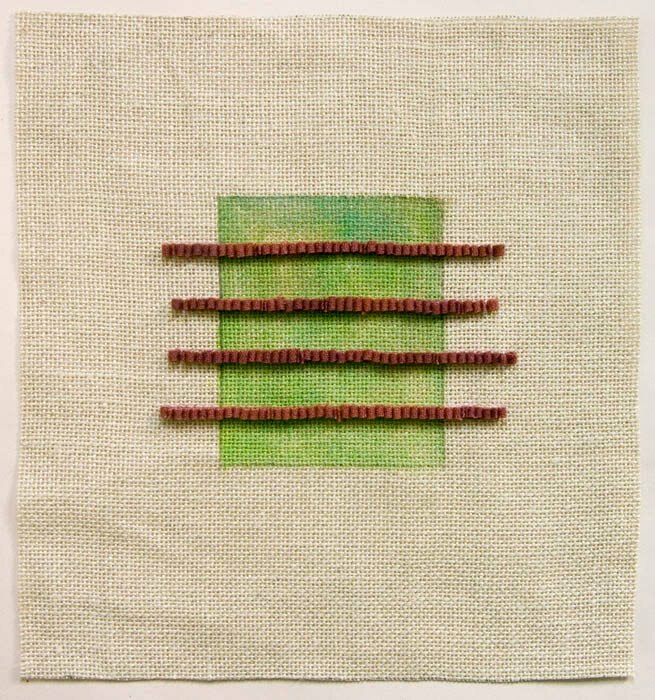 2011 #2, hand dyed wool and egg tempera on linen, 12 x 14 inches. Here are my first wool sketches of the new year. 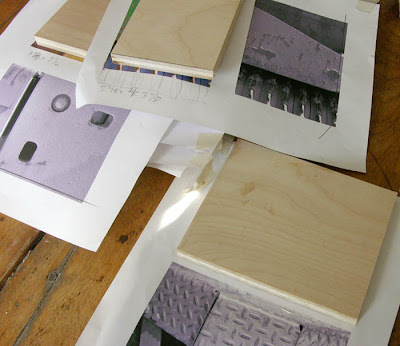 Because they're quick to do, I like working on them in batches, running through ideas. I feel as though I have the entire history of geometric abstraction to play with, to steal from. I am attempting different moods by the choice of color, from bright to dull, playful to serious, though on the whole the result seems playful to me; I've always liked a touch of humor in art. 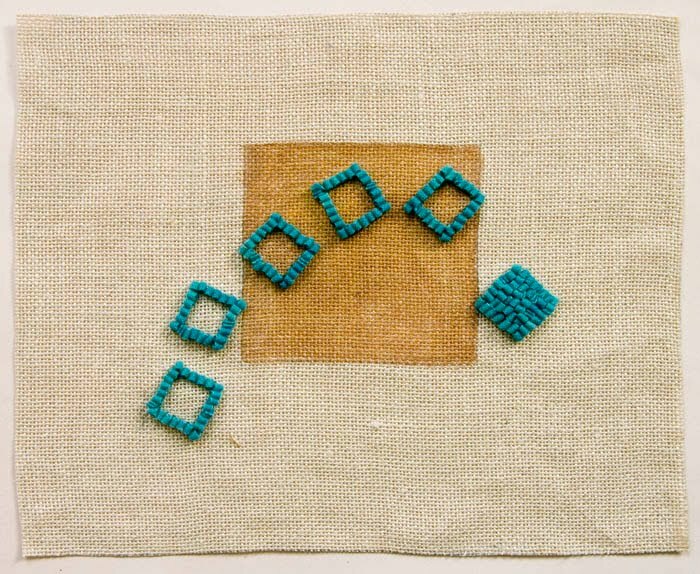 2011 #3, hand dyed wool and egg tempera on linen, 13 x 11 1/2 inches. 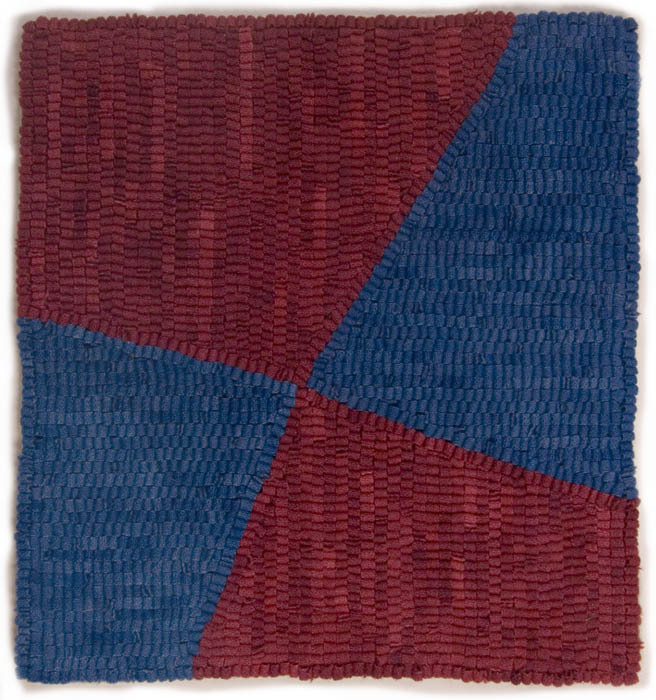 2011 #4, hand dyed wool and egg tempera on linen, 12 x 13 1/2 inches. 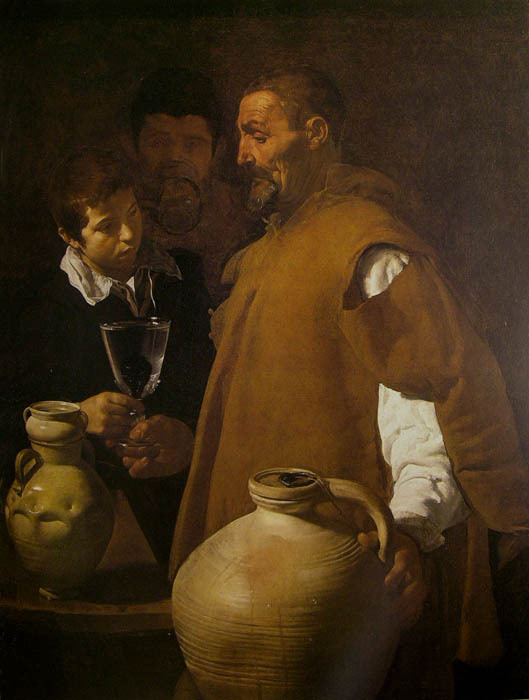 Velazquez, The Waterseller, 1618-22; oil on canvas; 41 x 31 inches. 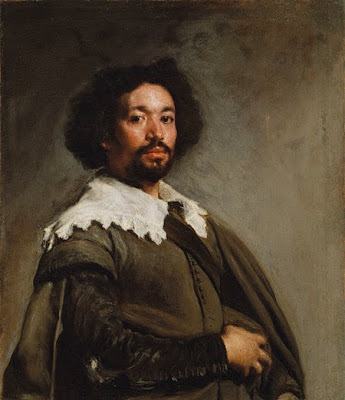 For many years, if I was asked to name my favorite artist, with no hesitation I acknowledged Diego Velazquez. For me, there is no artist who captures, with mere paint, the actual life of a subject, a physical presence living and breathing. The early works, such as The Waterseller above, have less of this breath, but are monumental descriptions of form and sympathetic portraits of ordinary people. 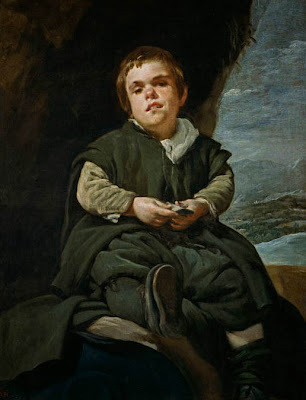 Velazquez, The Dwarf Francisco Lezcano, 1642-45; oil on canvas; 42 1/8 x 32 5/8 inches. Some of my favorite of Velazquez' portraits are those of the lesser people of his world, the dwarfs and jesters who he portrays with all the human empathy and seriousness an artist can possess. 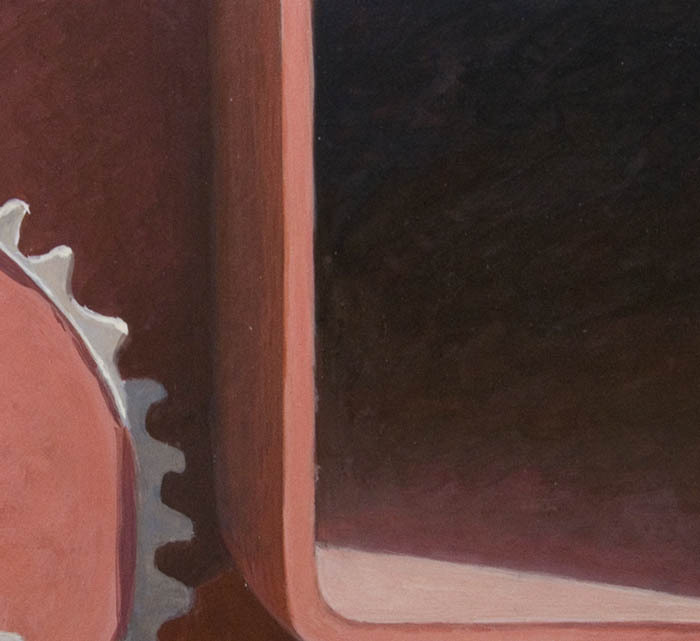 He applies paint in a free, fluid manner, softening the edges of forms: a head, its features, seem to move, as though we can see around the three dimensional body, bringing remarkable life to it. Velazquez, Juan de Pareja, 1650; oil on canvas; 32 x 27 1/2 inches. I have spent a lot of time in front of this portrait, which is at the Metropolitan Museum of Art in NYC. 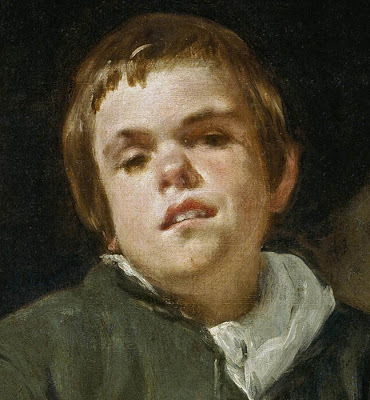 It gives me the opportunity to marvel at the seemingly simple means Velazquez uses to transform his canvases into compelling, communicating characters. 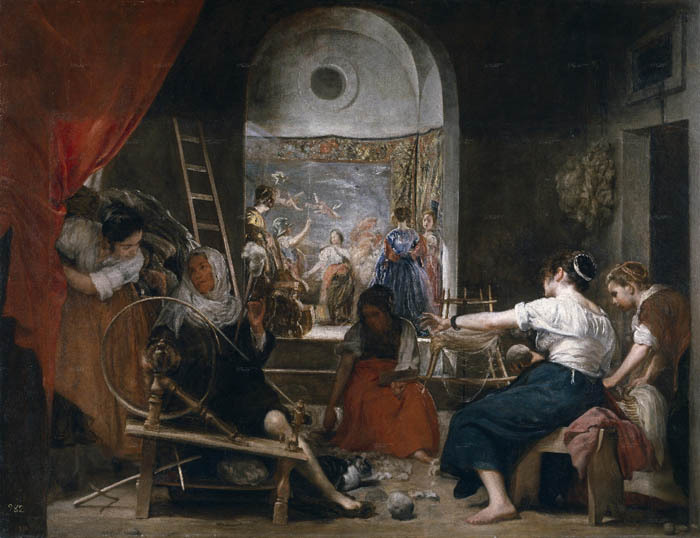 Velazquez, The Fable of Arachne or The Spinners, 1657; oil on canvas; 86 1/2 x 113 3/4 inches. 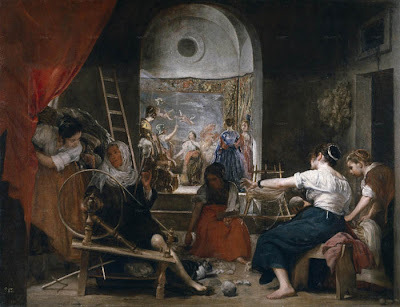 Velazquez was also a very ambitious artist, and this painting, along with Las Meninas at the Prado are overpowering, complex, and exciting, a swirl of forms in space. (The Prado has a wonderful website here, where you can find all the great work in their collections, with high resolution images which enable close viewing of details.) When I was a young artist I also had grand ambitions, painting large narrative figure compositions, and looked to artists such as the Italians of the High Renaissance and Velazquez as models. But now my ideas about my own work have changed, and my feelings about the great artists of the past along with them. 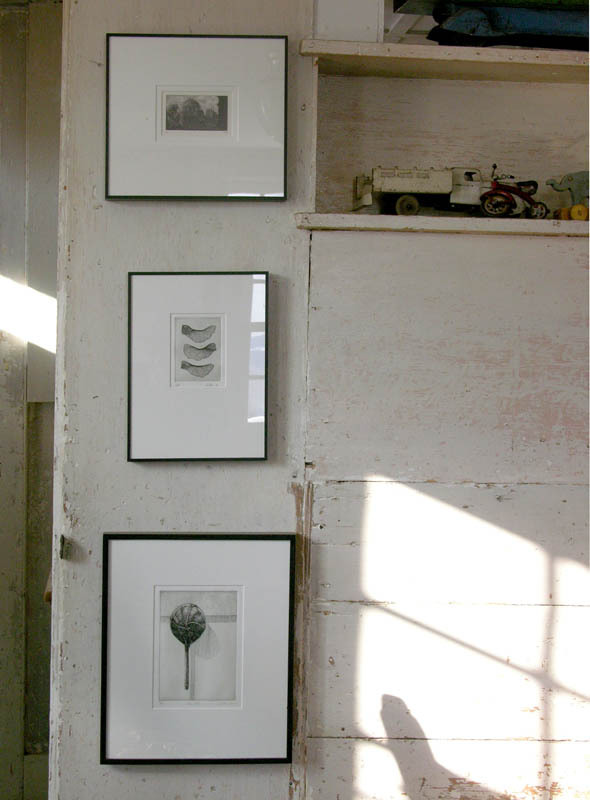 I no longer want to have a "favorite artist"; I see so much that moves me and enriches my life and my work. Now I see the clarity of the artists of the Quattrocento and their faith centered world as tremendously important, and I had overlooked them years ago. 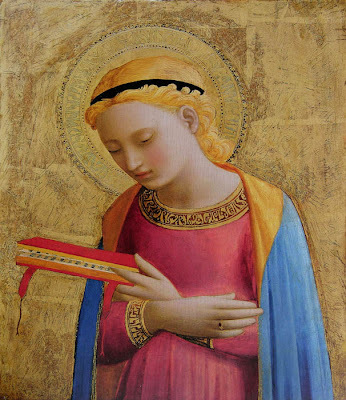 The panel paintings of Fra Angelico are among those that now thrill and inspire me. Fra Angelico, The Apostle Saint James the Greater Freeing the Magician Hermogenes, ca late 1420s; tempera and gold on panel; 10 x 8 7/8 inches. 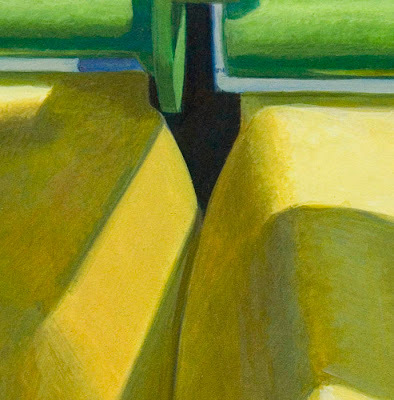 There is a simplicity of form in these works, a stylization of plants and buildings, a shining brilliance of color, a classical structure of horizontal and vertical. In this painting, one of my favorites, the turmoil of devils is subdued in an overall narrative reticence, but within the subtle gestures are a world of feeling and belief. In 2005-06, the Met mounted a major exhibition of Fra Angelico with a terrific catalog, from which I photographed these paintings. Looking at these small works, one stunning painting after another, was a magical experience. Their refinement and precise, loving touch have been a lesson to me as a tempera painter. 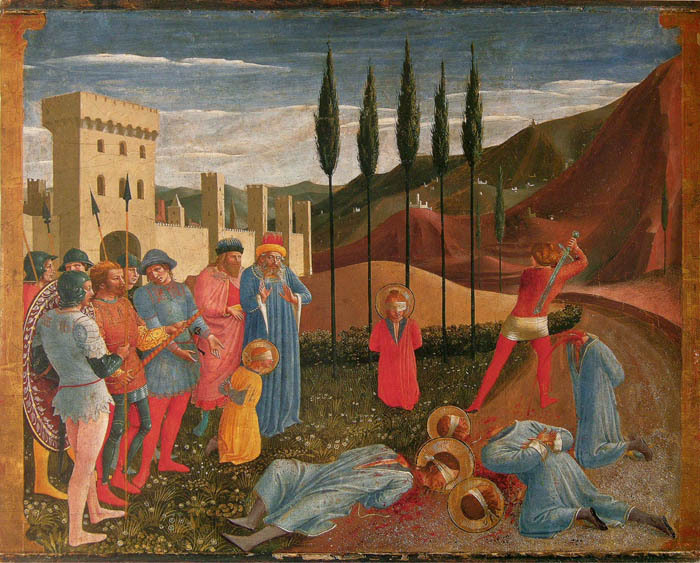 Fra Angelico, The Decapitation of Saints Cosmas and Damian, ca 1440-42; tempera on panel; 14 11/16 x 18 1/8 inches. Even within a gruesome scene of martyrdom there are delicately observed grasses and flowers and tall elegant trees standing as sentinels along with the human ones, as though to say that God's grace still exists in the world. 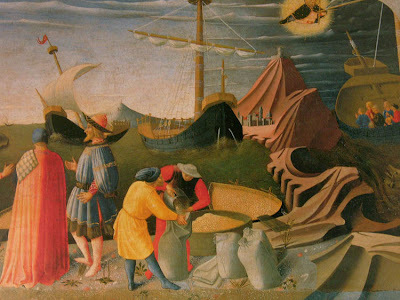 Fra Angelico, Saint Nicholas Calms a Tempest at Sea and the Miracle of the Ration of Grain (detail), mid 1430s; tempera on panel; 13 3/4 x 24 1/4 inches. The miracle in the story is heightened by the marvelous forms of curlicued mountains echoed in the swooping hulls at sea. 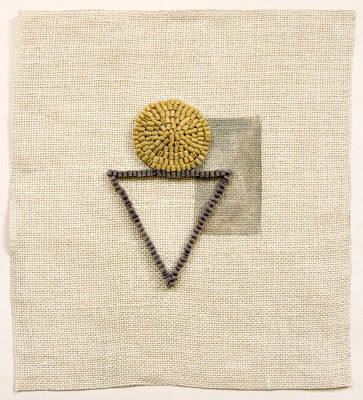 Each detail is reverently rendered, from the clothing of officials and workers to the bins of grain. 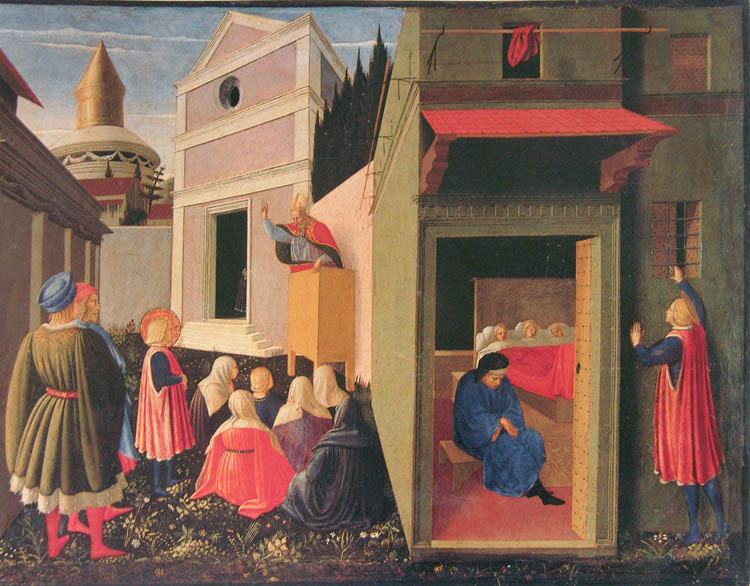 Fra Angelico, Scenes from the Life of Saint Nicholas (detail), ca. 1437; tempera on panel; 13 3/8 x 23 1/2 inches. There are balanced geometries in the settings for Fra Angelico's tales, creating orderly spaces for the movement of figures. Fra Angelico, The Virgin Annunciate, ca. 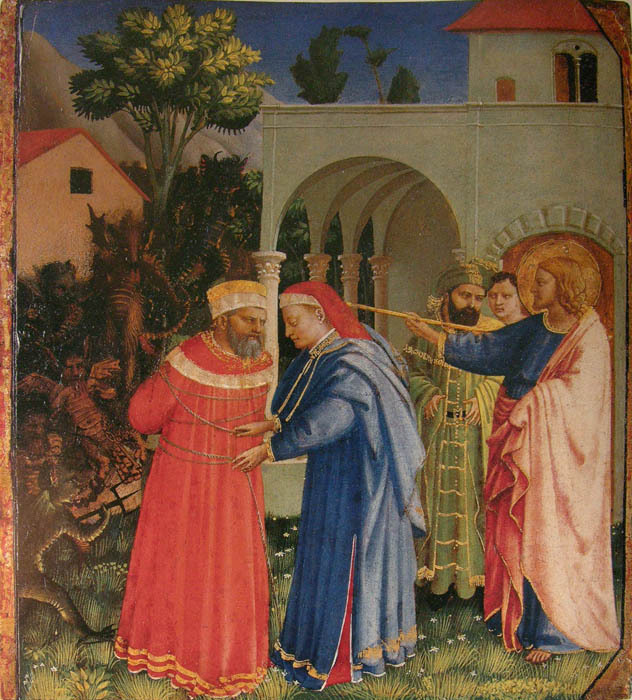 late 1420s; tempera and gold on panel; 12 3/8 x 10 inches. Within the sensitively precise outlines of the Virgin is a life prior to the flowering of humanism, when humankind became the measure of all things. It is inward and reflects a life of faith, where the representation of things of this world are a hymn to a higher being. Although I am not a religious person, I find this philosophy of representation very appealing as I look around me, at nature and objects, even machines, and see the beauty within them. 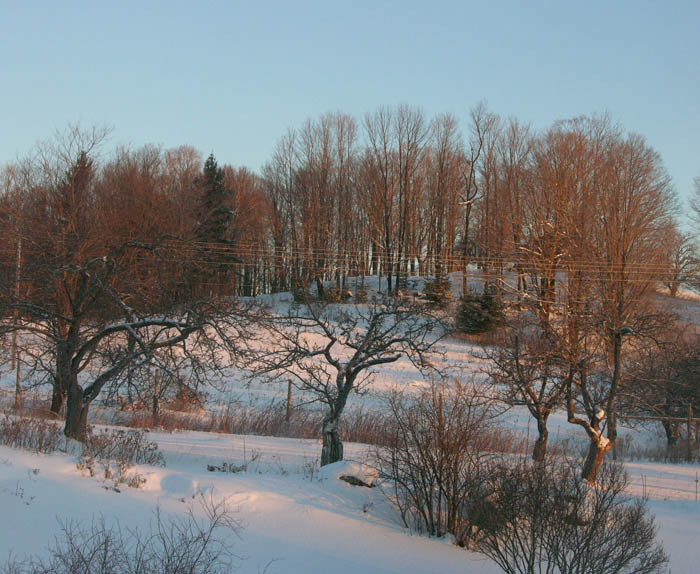 Winter, with all its difficulties of cold and ice and snow, has unique qualities of beauty unmatched at other times. 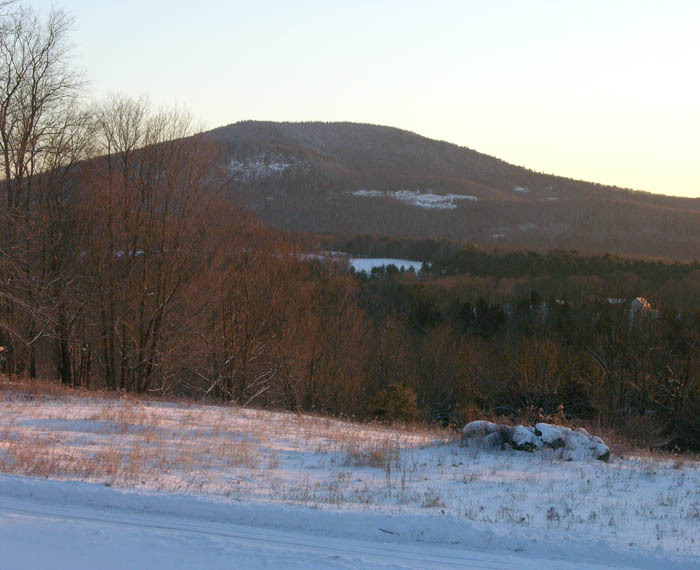 There is the sheer joy of waking to a warm-colored sunrise and its promise of brilliance. and the lace of bare branches appears as a soft red haze. 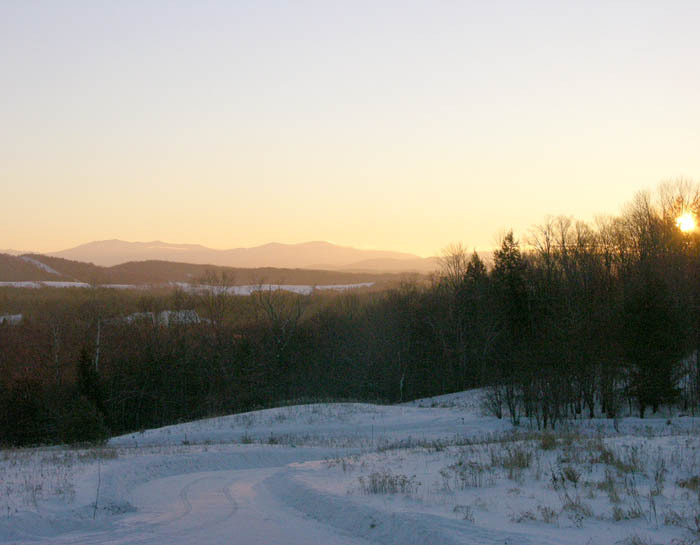 Henry David Thoreau wrote on January 11th, 1854: "Nature is now gone into her winter palace."